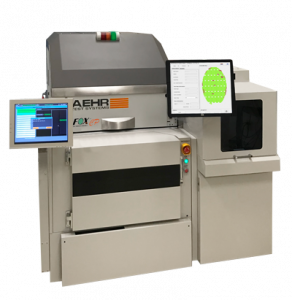 Fremont, CA (February 4, 2019) – Aehr Test Systems (NASDAQ: AEHR), a worldwide supplier of semiconductor test and burn-in equipment, today introduced the FOX-CP system, its new low-cost single-wafer compact test and reliability verification solution for logic, memory and photonic devices and newest addition to its FOX-P™ product family. Aehr will showcase the new FOX-CP system in Booth 4046 at the SPIE Photonics West conference being held at the Moscone Convention Center in San Francisco February 5-7, 2019. The FOX-CP system is available now for order and for shipment with standard lead times. 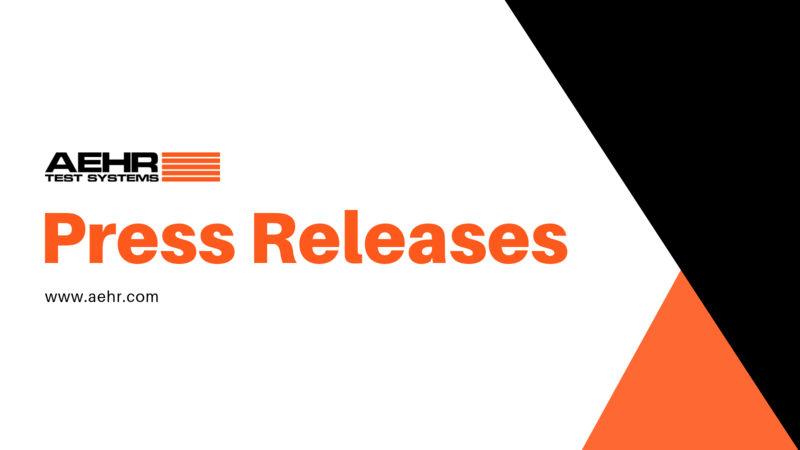 Gayn Erickson, President and CEO of Aehr Test Systems, commented, “The new single-wafer FOX-CP system is integrated with a wafer prober and performs wafer-level testing and reliability cycling for logic, memory and photonic devices. This newest addition to our FOX-P product family is optimal for test times ranging from minutes to a few hours or where multiple touchdowns are required to test the entire wafer. It complements the capabilities of the FOX-XPTM and FOX-NPTM systems, which are optimal when the test time is measured in hours or days and the full wafer can be tested in a single touchdown. The FOX-CP system offers a low-cost integrated package for both initial evaluations and production applications. 2,048 “Universal Channels” per wafer, enabling massively parallel test. Innovative “Universal Channel” architecture, where any channel can be any function (I/O, Device Power Supply (DPS) or Per-pin Precision Measurement Unit (PPMU)). Configurable with Universal Channel Modules, High Voltage Channel Modules or High Current Channel Modules. Ability to perform single touchdown or multiple touchdown wafer probing. Available as an integrated solution with prober and custom-designed WaferPak Contactor. Compatible with industry-standard wafer probers and probe cards. Testing tens of thousands of arrays per wafer with amps of current per array. Stabilizing lase and identifying infant mortalities through extended stress/test programs. Electrical and go/no-go optical detection. One application is to conduct single touchdown sampling test to confirm the processing of the wafer is within specified limits and the yield exceeds minimum requirements. The large number of 2A channels (4A with pulsing) available enables a large sample size (as many as 1024 die) with a single touchdown, while providing an individual power supply per die. Individual power supplies per die enable maximum monitoring for device reliability characterization. Another application is to perform multiple touchdown (stepping) aging of the full wafer to stabilize the lasing parameters of the die. The large number of high-current power channels can reduce the number of steps by an order of magnitude and increases production throughput. Stabilizing/aging the lasers allows higher-bandwidth performance of the end product, since the laser parameters can be matched and don’t change over time and brings the laser parameters into the narrow range required for effective control of the devices. Aehr’s FOX-P platform is the company’s next-generation multi-wafer and singulated die/module test solution that is capable of functional test and burn-in/cycling of photonics devices, flash memories, microcontrollers, sensors, and other leading-edge ICs before they are assembled into single or multi-die stacked packages. The FOX-P wafer-level systems utilize Aehr’s FOX WaferPak contactors, which provide cost effective solutions for making electrical contact with a full wafer or substrate in a multi-wafer environment. The configuration with the DiePak® Carriers enables burn-in of singulated die and multi-die modules to screen for defects in both the die and the module assembly process. The resulting known-good die, single-die or stacked-die packaged parts can then be used for high reliability and quality applications such as enterprise solid state drives, automotive devices, highly valuable mobile applications, and mission critical integrated circuits and sensors. The key features of the FOX-P platform that contribute to the cost-effectiveness of the solution include the ability to provide up to 2,048 “Universal Channels” per wafer or DiePak carrier, which allows the system to test all the devices on the wafer or DiePak carrier in parallel. The innovative “Universal Channel” architecture allows any channel to be any function (I/O, Device Power Supply (DPS) or Per-pin Precision Measurement Unit (PPMU)). This enhanced architecture now allows customers to perform per pin parametric testing, more extensive digital pattern test with deeper data stimulus / capture memory (32M per pin), and deeper scan (768M) optimized for BIST/DFT testing. A single FOX-XP test system may be configured with up to 18 blades of wafer test resources, enabling up to 18 wafers to be tested simultaneously. The footprint of the 18-wafer FOX-XP test system is similar to the footprint of typical semiconductor Automatic Test Equipment (ATE) that can only test one wafer at a time. The highly integrated 2-blade FOX-NP system has a very small footprint and is designed to be easily integrated into product design, reliability and test lab applications. The new FOX-CP single-wafer system is integrated with a wafer prober and performs wafer-level testing and reliability screening. Headquartered in Fremont, California, Aehr Test Systems is a worldwide provider of test systems for burning-in and testing logic, optical and memory integrated circuits and has over 2,500 systems installed worldwide. Increased quality and reliability needs of the Automotive and Mobility integrated circuit markets are driving additional test requirements, incremental capacity needs, and new opportunities for Aehr products in package, wafer level, and singulated die/module level test. Aehr has developed and introduced several innovative products, including the ABTS™ and FOX-P families of test and burn-in systems and FOX WaferPak Aligner, FOX WaferPak Contactor, FOX DiePak Carrier and FOX DiePak Loader. The ABTS system is used in production and qualification testing of packaged parts for both lower power and higher power logic devices as well as all common types of memory devices. The FOX-XP and FOX-NP systems are full wafer contact and singulated die/module test and burn-in systems used for burn-in and functional test of complex devices, such as leading-edge memories, digital signal processors, microprocessors, microcontrollers, systems-on-a-chip, and integrated optical devices. The WaferPak Contactor contains a unique full wafer probe card capable of testing wafers up to 300mm that enables IC manufacturers to perform test and burn-in of full wafers and panels on Aehr FOX systems. The DiePak Carrier is a reusable, temporary package that enables IC manufacturers to perform cost-effective final test and burn-in of both bare die and modules. For more information, please visit Aehr’s website at www.aehr.com.